Thomas Deans "Tom" Johnston was born on December 30, 1918 in Coldstream in Scotland. He grew up in Kelso and began his senior career with St Bernards (Edinburgh) before joining non league Peterborough United in 1938. Staying in the area, he guested for Bourne Town and Northampton Town during the war, joining Nottingham Forest (26 goals in 64 appearances) when the war finished. He moved onto Notts County in 1947 where he stayed (88 goals in 267 appearances) until leaving the professional game. In the days, County had a useful side which included one of England’s foremost international forwards Tommy Lawton. However, it didn’t prevent Johnston and his colleague s from losing to City in 1955 as we reached the semi final of the FA Cup. Starting as an inside left, he eventually made the left wing berth his own. After he retired, he gained coaching qualifications. In 1956, he took a coaching position with Birmingham City. He alao had a spell in Finland where his club, Valdokoski Harka won the Finnish FA Cup. His first British managerial post was at non league Heanor Town before managing Rotherham, Grimsby and Huddersfield (Oct 64 – May 68). He was appointed City’s manager on October 31st 1968 following the shock resignation of Joe Shaw. Tom Johnston enjoyed just over 6 years as City manager, including 2 promotion campaigns, the only City manager ever to achieve the feat, as he took us from the near the foot of Division 4 to as high as 5th place in Division 2. At York, a canny Scot, he earned a reputation as a shrewd operator in the transfer market. After a slow start, he put his own stamp on the team. In 1970/1, we won promotion from the bottom flight, a run of 10 wins and a draw in eleven games in the spring helping us to clinch the final promotion place. In each of the next 2 seasons we avoided relegation on goal difference. In the following 1973/4, season, City shocked the football world by winning promotion to Division 2 (then England’s second tier). A remarkable fact given, even now, it is City’s only experience of playing that high up the football ladder. The team had been shrewdly strengthened with 4 key signings for £35,000. That season we set a club record of 19 drawn games (which was only equalled in 2008/9) and also equalled The Football League record of eleven successive games without conceding a goal. Described as a “dour and canny Scot” and hot on discipline, his team reflected him. It was a solid, rather than spectacular, team where all 11 players were the key to success. 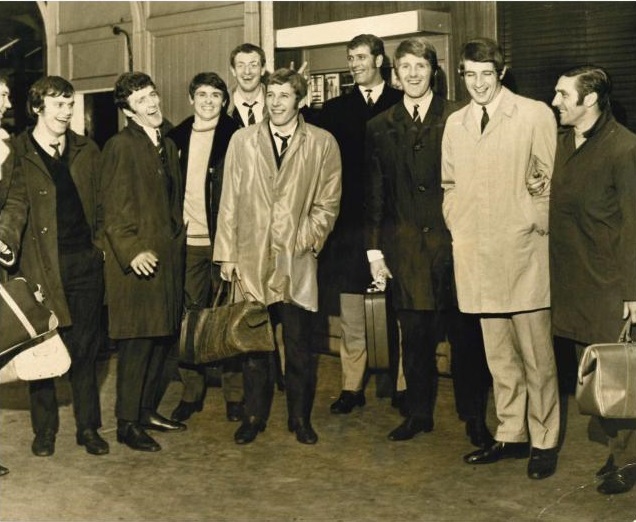 The team was based around Graeme Crawford and Ian Holmes, two reserves team players signed on free transfers from Sheffield United. Some thought Crawford was close to earning a Scottich call up, whilst Holmes was full of powerful runs (and goals) from midfield which turned many a game in City’s favour. Also in midfield, were veterans Ian Butler and Barry Lyons, who cost little more than a combined £20,000 and strikers Jimmy Seal and Chris Jones who cost around £7,000 each. Whilst the 2 veterans had both enjoyed successful careers in England’s top 2 flights before joining City, the other 4 never achieved as much after leaving City as they had whilst playing for Johnston’s City. The same can be said for most of the rest of that side. Behind them, they were ably supported by a measly defence. Only Barry Swallow and John Stone were signed. With Phil Burrows and Chris Topping, they were to form one of City's best ever back units. His personality didn’t always endear him to his players. In 1972/3, the City players gave him a vote of no confidence, in an era where our dressing room was literally bug infested and disease ridden. At the time, a common saying in the dressing room was,"in spite of him (Johnston), we will succeed". His coaches Billy Horner and later Colin Meldrum being credited with training and tactics. Looking back through, many of the players who played under him noted his “Scottish”attitude to money when it came to contract negotiations. Coupled with the parsimony of the board, it might have clouded some contract negotiations. Certainly Phil Burrows was disappointed enough with the new contract offered to him in 1974. Newly elected as City’s first ever player of the year on our promotion to Division 2, he left immediately preferring to stay in Division 3 at Plymouth. However, on the pitch, his team was usually more than the sum of its players. Former players are glowing in their praise of his tactictal and motivational skills. 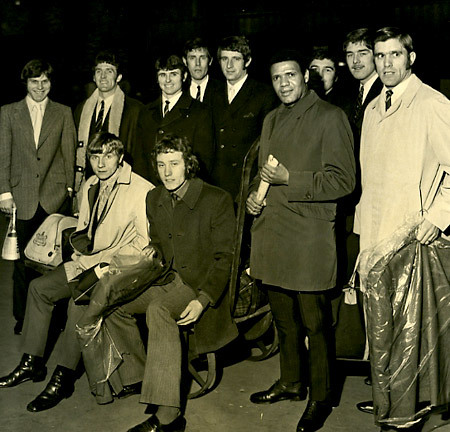 The City team that he lead out of Division 4 in 1971 were to stay outside the basement division for 6 seasons, still the longest time we’ve remained outside the basement. In January 1975, City’s cup exploits again shocked the football world as we earned a comfortable 1-1 draw with Arsenal at Highbury in The FA Cup. After the game, Johnston shocked City by announcing his decision to resign from City to return to Huddersfield as their General Manager. His stayed with City for one more week, including the 1-3 defeat by Arsenal in the cup replay. Johnston had ask the directors to be released 2 weeks before Arsenal game and his departure was agreed at a board meeting on January 2. The Huddersfield approach was believed to be the third City had faced during Johnston's era. A bid from Grimsby early in his time was rebuffed, as was a bid from an unnamed club, believed to be Doncaster, towards the end of his reign. At the time of his departure, he was just 10 months into a 4 year contract and had previously been on a 5 year contract. Although at the time, playing a division below City, he received a substantial pay increase on joining Huddersfield. We were mid table when Johnston left us and we managed to hold onto our Division 2 status at the end of the 1974/5 season. After his departure, we suffered successive relegations in each of the following 2 seasons and were back in the basement division. The team had grown old together, Wilf McGuinness was unable to rebuild it on a limited budget, given Johnston’s track record, it would have been interesting to see how he would have gone about it, certainly he couldn’t have done a worse job than McGuinness. Many older reader will argue, with just cause, that Johnston was City’s best ever manager. He built a successful team on a shoestring budget and is the only manager to lead City to 2 promotions. When the remnants of the team that he’d built returned to Division 4 in 1977, it was 6 seasons after Johnston’s first promotion. To this day, City have never spent longer in a higher division of the Football League and Tom Johnston is the only City manager to lead us to 2 promotions. In a 2013 vote to celebrate 125 years of the Football League, Tom Johnston was voted City’s greatest ever manager. Read a review of Chris Jones' book, "The Tale Of Two Great Cities and his views on Tom Johnston.